An embracing chair designed to soothe anxiety and a lamp that anyone can be taught to manufacture are among items of furniture designed for prisons by students from Norway's University of Bergen. The third-year bachelor students from the university's faculty of design (formerly the Bergen Academy of Art and Design) worked with Norwegian Correctional Services to develop the projects, which are intended for inmates of Bergen Prison. The students, who showed their prototypes at this month's Stockholm Furniture Fair, had to consider the particular needs and challenges of this group of users. They were given the option to tailor their projects to prison facilities, or focus on transitional or post-release housing. Alternatively, they could design objects based on simple manufacturing methods that could be taught to inmates in prison workshops. Among the furniture prototypes is Amanda Ivarsøy Kovacs' oiled solid oak Corners chair, created for a post-release environment. 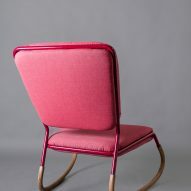 Bounded by high backrests on two sides, it is distinguished by its pastel upholstery and tube-like accompanying cushion. The chair is designed to ease anxiety by offering the sitter a mix of control and protection. "If an inmate leaves prison after many years, it can seem like the world has grown extremely fast and everything is quite new, and that can lead to stress and anxiety" Kovacs told Dezeen. "I wanted to give the sitter full control, so when you sit in this chair you have a high backrest that protects you but you still can have a full view over the room you are in." "Then you have this soft tube to kind of have this hug," she continued. "It's like the chair embraces you and gives you comfort. You can switch it to the position you like the most." 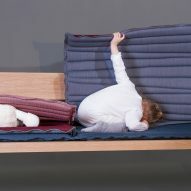 Frid Smelvær Høgelid also focused on easing stress with her design, the Nami daybed, which has an S-curved mattress to promote relaxation, while Kamilla Stokkevåg focused on the the body's need to constantly shift positions with her modular design. Other students focused on objects that inmates could construct themselves, like Elisabeth Frafjord Solberg's Light-Up standing lamp. "The idea is that they can make something more beautiful in the workshops than what they make now, and it's supposed to be easy construction so that they can produce there some of the parts, if not all of the parts," Solberg told Dezeen. "I wanted to give them something to make that they could be proud of." 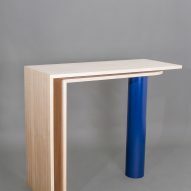 Solberg's lamp fulfils the brief because its metal shade and frame are easy to bend into shape, and inmates can be easily managed across just a few construction stations. Vilde Sæternes Johannesen's Dypp lamp is also designed for prison workshops where inmates are trained to steam-bend the solid oak frame. 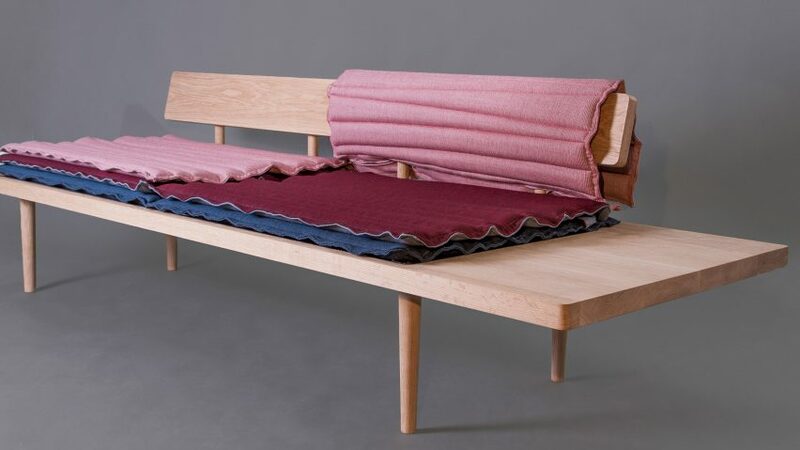 Simple solid oak elements are the basis, too, of Tora Schei Rørvik's Imillo daybed and Lena Mari Skjoldal Kolås' Gerrit shelving, both furnishings designed to suit contemporary homes. A number of student classes showed their work at the Stockholm Furniture and Lighting Fair, which ran from 7 to 11 February 2017 and featured a "Greenhouse" dedicated to young designers. 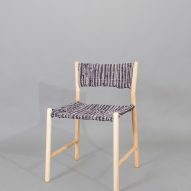 Joining the Bergen students was Helsinki's Aalto University, which presented a range of chairs made using only three thicknesses of galvanised steel rods.